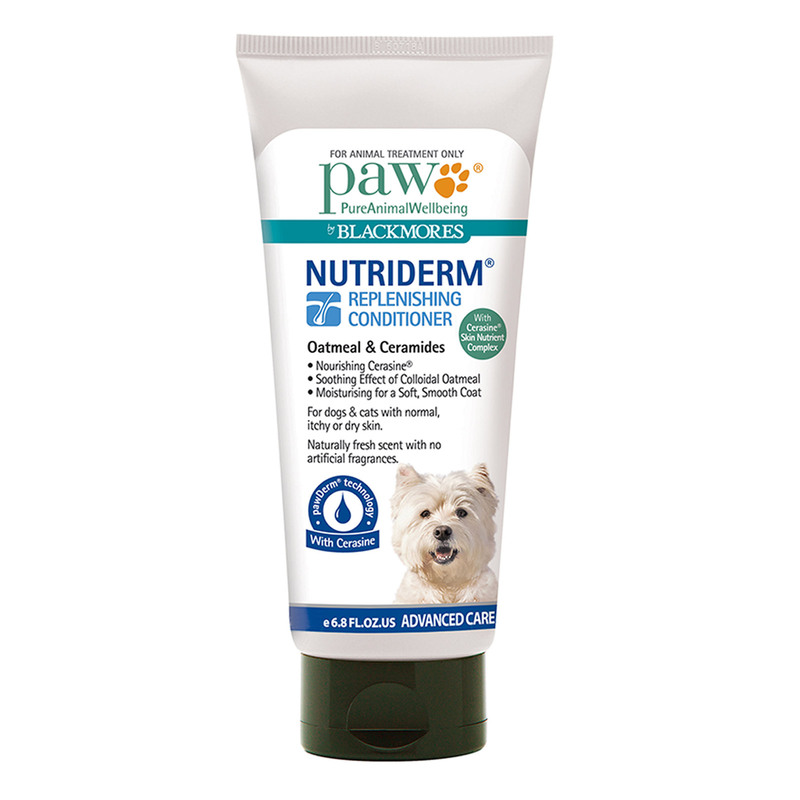 PAW NutriDerm Replenishing Conditioner is an advanced product that nourishes and nurtures dog’s skin and coat. It refreshes and leaves skin and coat smooth, silky and fresh. Enriched with natural ingredient, this pet conditioner replenishes skin and hair apart from improving overall appearance. Moisturising ingredients gently detangles thus helps to effortlessly comb and brush through all that hair. Natural fresh scent adds refreshing touch to dog’s body and enhances its appearance. Added colloidal oatmeal provides soothing effect and the complex nutrient cerasine nourishes skin intensely. Use after PAW NutriDerm Replenishing Shampoo. Apply on the wet coat and leave it for few minutes. Rinse it off lightly for smooth and silky hair. An innovative formula that deeply nourishes and moisturises dog skin and coat. It prevents dehydration of skin by forming a healthy skin barrier. Gently detangles coat and improves skin health. With no harsh chemicals, it is safe to use on dogs. Ingredients Purified water, behentrimonium methosulfate and cetearyl alcohol, glycerin (vegetable), sorbitol, avena sativa (oat) kernel flour, surfactant, ceramide mixture, jojoba seed oil, avocado oil, shea butter, emollient, panthenol, hydrolysed oats, rosa canina seed extract, preservative, citric acid, sodium gluconate, rosemary leaf extract mixture.